In 1999, Gina designed and created the cake of her dreams. This was no ordinary cake, though—it was “the one”—the one that sealed the deal. 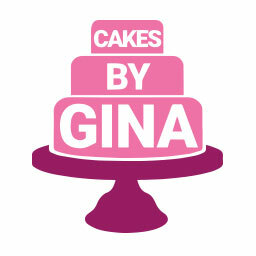 2003 saw the opening of Cakes by Gina, a small bakery with a passionate cake maker at the helm. Within two short years, the small business grew with employees, clients, and popularity. That growth continued until 2008 when her success outgrew her space. Gina expanded her location with a new kitchen and another world of possibilities. On a day as symbolic as your wedding day, every part of your ceremony should represent the beauty of love you’re celebrating. Gina’s wedding cakes can be made to any specification. They can stack elegantly gold leafed layers into awe-inspiring towers or create cakes that tastefully display the newlywed couple’s shared vision. 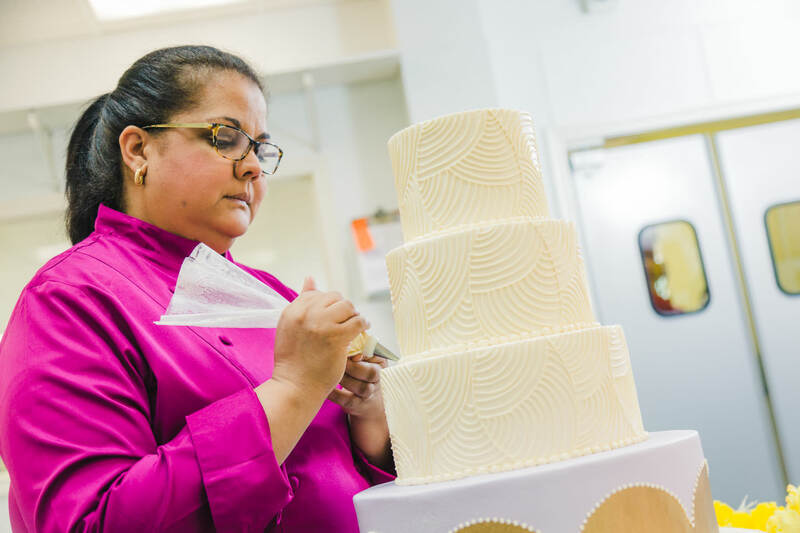 Gina's devotion to exceptional flavor and impressive structure will make the wedding cake stand out. Our Groom’s Cakes range from whimsical to awe-inspiring. Gina and her team have crafted 3D cakes in the shape of guitars and Aggie Rings, R2D2 and sports cars, even Brewers Stadium (with real working lights)! Regardless of your design aesthetic, Cakes by Gina can create a custom cake that will be almost too awesome to eat (but definitely too delicious to resist)! For sweet tidbits of flavor in inviting packages, try Gina’s delightful cake balls. These bites pack the punch of a full-sized cake in a bite-size serving. The treats come in a variety of classic and exotic flavors for all kinds of cake lovers. From the richness of the mocha aroma to the colorful confetti sprinkles of birthday cake, these morsels are sure to be the talk of the party. Where to start! Cakes by Gina did an outstanding job on our wedding cake as well as my husbands groom's cake. You never expect the cake to come out even better than the Pinterest photo you picked BUT Gina will exceed and pass the bar on your expectations. We had a very large 5 tier wedding cake and it was devoured with not a slice left. My family and friends were all amazed at not only how beautiful my cake was but how delicious it taste. Thank you Gina for making our wedding cake dreams come true. We had our wedding scheduled during Hurricane Harvey and she worked hand in hand with my aunt when we had to reschedule and was so understanding/flexible. She is truly talented at what she does and you won't regret booking her for your event. When I walked in Cakes by Gina I was impressed with the attractive and clean store front. My wedding cake quest ended the moment that I tasted her delicious and moist cakes. Outstanding!! Working with Alex, Gina’s sister, and Gina herself was a pleasure. They are personable, professional and have a keen eye for detail. Cake tasting was a stress free and joyful experience. Gina, I want to thank you and your great team for my beautiful and delicious wedding cake, a dream come true in such a short notice. My guests were delighted, raving about the cake, telling me that it was the best wedding cake that they have ever had. All of them wanted to know who made it! Cakes by Gina is the place to get your cake, I highly recommend it. You won’t be disappointed. Our wedding cake was so delicious, the photographer had to stop me from saying "Ohhh my goodness," and smile normally when she was taking our "cake cutting" photos. Gina's cakes are out of this world delicious. My husband and I couldn't agree on flavors during our tasting, so we went with alternating tier flavors. He had the white cake with raspberry filling, and I had the tres leches (which is AMAZING) with pineapple filling. We had buttercream frosting for all of the tiers. The cake was so fresh and moist! The buttercream work was GORGEOUS! Gina nailed the color of the bottom tier to match my accent color of light lilac. It perfectly matched my bridesmaids dresses and napkins. My guests raved about how delicious the cake was and were shocked at how amazing it looked and tasted since they were so used to dry wedding cakes. And to top it off, Gina's team was so amazing at setting up all the appointments and confirming our details. Thank you so much, Gina! You and your team are so talented. I can't wait to design another cake together! We could not be happier with Cakes by Gina! From our initial meeting to seeing it on our wedding day, everything was perfect. During our initial consultation they were asked what types of flavors we might be interested in and we got to taste all the flavors as well as all the fillings. It was great that even the tasting was customized. The groom's cake was the hit of the reception… No one could believe that it was really a cake. I would say that anyone could have complete faith that Cakes by Gina could produce exactly what you want, and get it there on time. I cannot recommend Cakes by Gina more! !